This is part 27 of excerpts from the trail log which was located on a New York portion of the Appalachian trail. For the post which explains this series, click here. You can read all the previous hiking posts by clicking here. Each new edition includes a quote from a hiker, along with this writer’s insight into what the person might have meant. Your interpretation may be different! You got this. You did this. Keep it up soldier. You don’t have to be the best. You just have to do your best. The trail log excerpts from hikers are so interesting because many of them are encouraging and inspiring in nature. 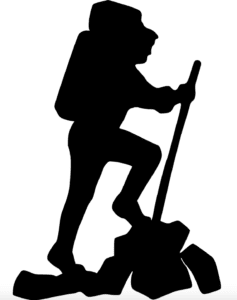 People who hike seem to, in general, be those who are of the “you can” mentality. And the hikers who write in this particular trail log also seem to be people who want to help others. Instead of tearing people down, they want to build them up. Think for a moment of what you might have read this morning on your social media pages. How many of the posts were critical in nature? Did any of them bemoan the ills of society? Were they complaining in tone? Or were the things you read comments that might make the readers want to be a better version of themselves? If your social media pages are like mine, most were the first three and not the last. So the upbeat nature of these posts is why this hiking log is so much fun to read! But back to this specific hiker. Perhaps his words were focused on someone in particular. Maybe they were writing to a friend hiking on the trail with them, or a loved one at home. Perhaps someone they know was dealing with an illness or another hardship of some sort. And they were sending that person thoughts of encouragement to help them along their path. Or maybe these words meant something else. Perhaps the hiker was dealing with something troublesome in his own life. It could be the hiking itself. Or it could be a personal challenge of another kind. Maybe our hiker was writing these words to himself, a mantra of sorts to help him get through whatever was going on. This writer says you don’t have to be the best. You just have to do your best. And those words are why I selected this post to highlight. Aren’t our lives all about finding out who we are, embracing our own uniqueness, and being the best “us” we can be? Isn’t that what this hiker is stating? That we have to do whatever it is that will allow us to be our best self? And on that wonderful thought, I wish anyone who is reading this the energy and focus to be able to pursue your best you. I hope that is the focus of your day today, and every day that follows.